Maker's Mark Unknown? Antique or Modern Replica? 18k diamond bracelet with 1.80ct of diamonds in an Art Deco style. Bought from an antique dealer who had very little background regarding its age. 18k, D180, 750 and others that are obliterated. The maker's mark appears to be a J and a B in capital letters, inside two circles (imagine a pair of spectacles). 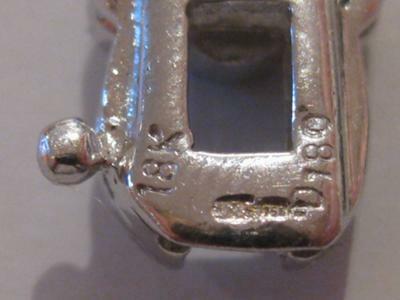 The maker's mark is on the tongue of the clasp and the others are on the receiving clasp.